It’s winter. It’s cold. 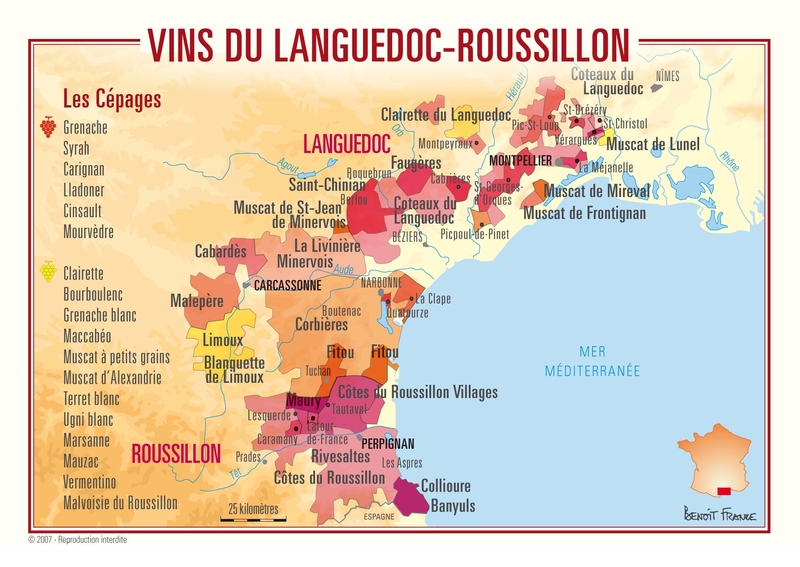 Now is the time for big hearty red wines from the Southern French region of Corbières and Minervois part of Occitanie, formerly known as Languedoc-Roussillon. 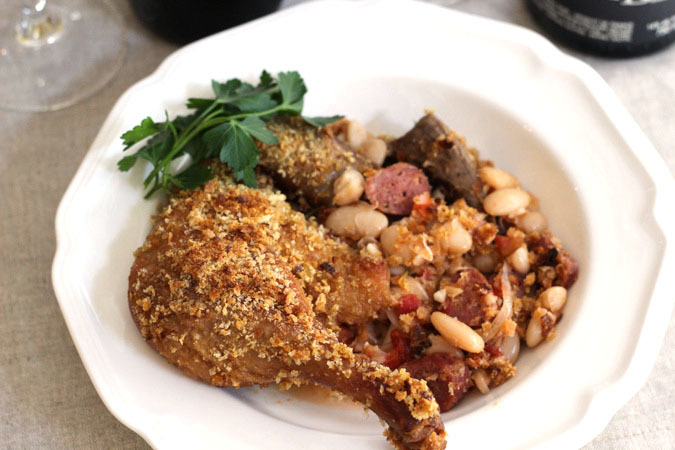 Cassoulet, the regional signature dish is a classic pairing with the wines of Occitanie. I made a cassoulet for the first time, I was snowbound, and it couldn’t have been more timely. Need a wine and dish to chase the cold away? Look no further than Corbières, Minervois and, cassoulet. The French Winophiles are starting off our 2018 calendar focusing on the Southern French appellations of Corbières and Minervois. Join our conversation on red wines and food from this region, Saturday, January 20 at 11:00 am ET on Twitter using the hashtag #winophiles. Disclosure: I received two bottles of wine courtesy of Wines of Languedoc. Minervois AOC is located north of Corbières AOC. Minervois is less rocky and rustic in terrain as compared to Corbières. The soil types in Minervois are also considered diverse. The climate is influenced by the Mediterranean, gets a cool air stream from the Black Mountain, and experiences greater rainfall. Minervois was also granted AOC status in 1985. The allowed red grape varieties include; Carignan (making up no more than 40% of the final blend), Grenache, Mourvèdre, Lladoner Pelut, and Syrah. Minervois red wines tend to be fruitier with fewer tannins than red wines from Corbières. The wine is a blend of 60% Carignan, 30% Grenache Noir, and 10% Syrah. It is from the Corbières Boutenac appellation; grapes were hand harvested, the Grenache and Syrah were destemmed by hand. The Carignan went through carbonic maceration. The wine was fermented in temperature controlled vats for 14 days, racked into barrels after six months, and aged in French oak barrels for six months. Tasting Notes: Ruby in color with a magenta hue at the rim. Medium bodied with balanced acidity and tannins. Notes of black fruit, cherries and a hint of licorice on the finish. The wine is a blend of 70% Syrah, 20% Grenache, and 10% Carignan. Most of the grapes come from the dry areas of Les Mourels and Les Coteaux, grown on slopes of sandstone. The Syrah is sourced from vineyards around the village of Caunes, influenced by the ocean and grown in soils of limestone and clay. The wine was aged 30% in tanks, 20% new and one-year-old wood, 20% barrels of 225L new and one-year-old wood, and 30% barrels of 400L one and two-year-old wood. Tasting Notes: Dark ruby in color. Medium + body with medium tannins. Concentrated notes of black fruit with spice, hints of chocolate, anise, and graphite. On the finish dried figs. The classic cassoulet dish originating in Southwest France is basically a dish of white beans (Haricot Tarbais) and meat, lots of meat! As I mentioned, I made this French masterpiece recently for the first time to pair with the two wines from Corbières and Minervois. The pairing is a classic in the sense cassoulet originates from the region where these wines grow. But the wine varieties; Syrah, Carignan, and Grenache Noir compliment this dish in their similar rustic, bold styles. 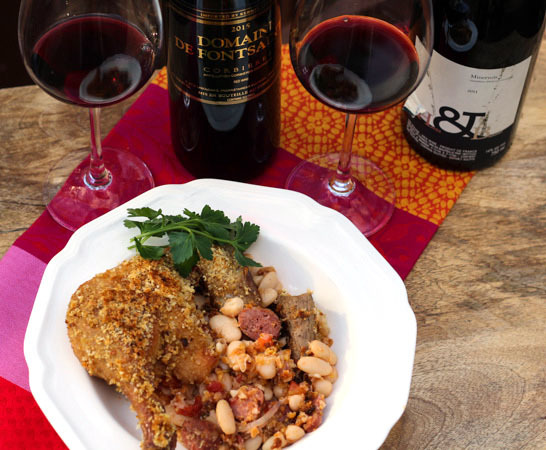 The cassoulet with its rich fat and proteins is balanced with the tannin and acidity found in the wines. Cassoulet is a project and depending on how “authentic” you want to make it, tracking down/ordering ingredients takes planning. A snowy cold winter day is the perfect day to schedule making this classic French dish. 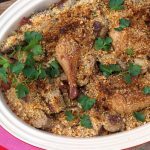 I adapted Mimi Thorisson’s cassoulet from “French Country Cooking.” It was delicious, and serves an Army so invite some friends and don’t forget the wine! Put the dried beans in a large stock pot, adding three times as much water, and let them soak overnight. The next day, drain and rinse the beans. Return them to the stock pot and add cold water to cover by 2 inches. Stick the cloves into the whole onion and add to the pot along with, carrots, bouquet garni, dried cured sausage slices, slab of bacon, 1 tablespoon tomato paste, and one teaspoon salt. Stir to mix the ingredients. Bring to a boil, and then reduce heat to a simmer. Cook the beans for about 1 to 1-1/2 hours. Beans should be cooked but still hold their shape. In the mean time, in a large deep frying pan, heat 1 tablespoon of extra virgin olive oil over medium-high heat. Season the pork shoulder pieces with salt and pepper, add to the pan and brown the meat on all sides for about 5 minutes. Season the meat with piment d' Espelette and sprinkle with the thyme leaves. Add just enough water to barely cover the meat, bring to a boil and then turn heat down. Simmer for 30 minutes. Remove skillet from heat and scoop pork from liquid, reserving the liquid and pork separately. In another large frying pan, heat 1 tablespoon of extra virgin olive oil over medium-high heat. Add the Toulouse/pork sausages and brown on all sides about 10 minutes. Turn the heat down to medium and continue to cook for 10 minutes. Reserve to a plate. Season the lamb pieces with salt and pepper. In the same pan, sear the lamb pieces until brown on all sides. In a large Dutch oven, heat the remaining 2 tablespoons of extra virgin olive oil over medium-high heat. Add the sliced onions and garlic and sauté for about 5 minutes or until onions are golden. Retrieve the bacon slab from the bean pot and dice the bacon, and add to onions. Continue to cook for a few minutes. Strain the beans, reserving the liquid and beans separately. Pick out the onion with cloves, bouquet garni and discard. Pick out the dried cured sausage and reserve. Add the beans to the Dutch oven, add the tomatoes, and remaining 1 tablespoon tomato paste. Gently stir to combine. Pour enough of the bean and pork shoulder liquid to just cover the bean mixture. Bring mixture to a boil over medium-high heat and then reduce heat. Simmer for 20 minutes. Mix the bread crumbs with just enough extra virgin olive to moisten the bread crumbs. Slice the Toulouse/pork sausages. Arrange the lamb, sausages, pork shoulder and duck legs on top of the beans. Sprinkle the bread crumbs over the meats. Drizzle a little olive oil over the top. Bake in oven for 20-30 minute and then broil for 5-8 minutes until bread crumbs are golden. Serve immediately. Rumor has it cassoulet is best reheated the next day. To reheat, remove the cassoulet from the refrigerator one hour before you plan to reheat. Preheat oven to 350 F. Break the bread crumb top to see if much liquid remains beneath the surface. If needed, add 1/2 cup warm water. Bake cassoulet for about one hour to reheat. Check out what my fellow #Winophiles tasted and cooked up with wines from Corbières and Minervois. Wow, this version really does have a lot of meat….Can’t go wrong with Mimi though. Sounds amazing. I read through your recipe and it does seem like it’d feed an army Jane! But then again, if you’re going to go to the trouble to make it, might as well make lots as it’s probably even better the second day! Did you prefer one wine over the other with the cassoulet? 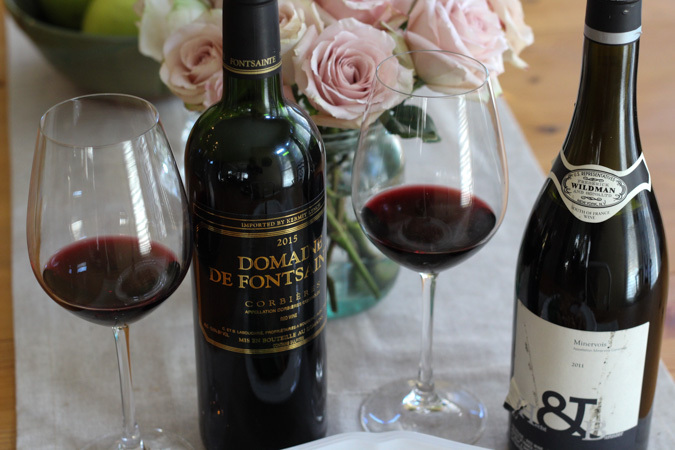 Both wines paired well with the cassoulet, however, I did prefer the Domaine de Fontsainte Corbieres. It had more tannin and acidity to counter the fat and protein in the cassoulet. Sounds Delish. Will have to try Mimi Thorisson’s recipe, so hearty and yum. Great tasting notes and background on the region. Cheers!! Thank you and welcome to the French Winophiles! A perfect feast for blizzard conditions! Not only did it feed a crowd, but it gave you a snow day project. Hope things are warming up for you in Atlanta; we’re still pretty chilly here in South Florida. The cassoulet project was indeed timely with our cold snap. Today, all the snow is gone (thank goodness) and 68 F! That looks like a lovely dish! Lots and lots of comfort in that pot. I thought my version had a lot of meat. Wow. Can’t wait to try this. Thanks! Yes, I must say I was overwhelmed with the abundance of meat, but it did provide that winter stick to your ribs comfort food element. The Haricot Tarbais beans were my favorite part, pricey but oh so deliciously creamy and tasty. Your cassoulet looks amazing. Spiced pear sausage? WOW! I have never heard of that. I love that you had a Hecht & Bannier. I had lunch with one of the owners when I was in Provence in 2016. Great guy and they are really doing a lot to draw attention to the Languedoc. Excellent Jane! The spiced pear sausages were the best substitute to the Toulouse sausage. The pear sausage had similar spices to the Toulouse with the addition of Applejack Brandy and of course pear. And they tasted amazing! I was very excited to receive the Hecht & Bannier Minervois. I had read good reviews about their wines. Very cool that you had lunch with one of the owners in Provence, I am sure it was a memorable lunch in every way. Nice post, Jane. What fun for us all to find different incarnations of cassoulet. I was surprised by the sheer amount of meat as well. I actually left out some of the ham hock because it just seemed like too much! Thanks Jeff. Made for some tasty leftovers. Mimi Thorisson does such lovely things – very tempting to make all of her meals. This turned out wonderfully- what a fantastic meal to have in the rotation. Thanks Jill. So true, Mimi’s cookbooks are filled with tempting recipes and beautiful photos. Thanks Martin. Being snow bound is only fun when you have a good supply of wine in the house and cassoulet in the oven! Everything looks so delicious and loved the details on the two regions. looks like you went all out with your first cassoulet! Lots of meat, I hadn’t noticed lamb in the other recipes I’ve seen. I did go all in for my first cassoulet! I found so many different variations, but wanted to make a more traditional cassoulet which includes pork, duck, and, mutton.